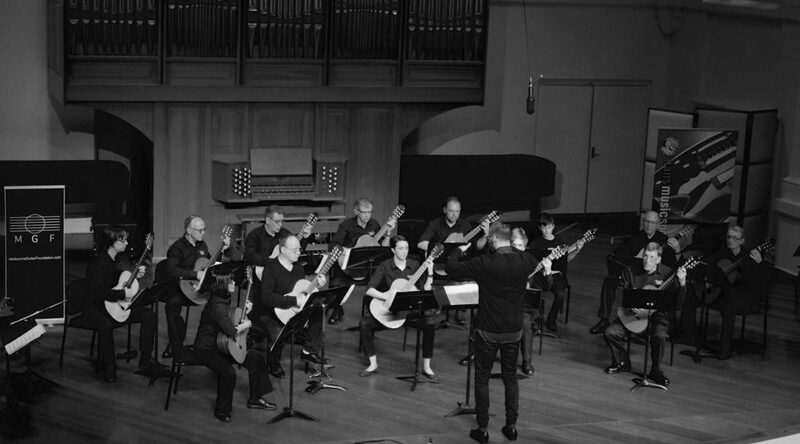 Formed in 2009 through the Classical Guitar Society of Victoria, the Victorian Guitar Orchestra (GO) was originally a forum for classical guitarists from all backgrounds to enhance their ensemble skills and gain further performance experience. Under the direction of Benjamin Dix (Melbourne Guitar Quartet), the GO has now fast established itself as Victoria’s leading amateur guitar orchestra, having performed at the Melbourne Guitar Maker’s Festival, Melbourne International Guitar Festival, the Melbourne Recital Centre and with artists such as Z.O.O Duo and MGQ (Melbourne Guitar Quartet). Through a blend of contemporary works, unique arrangements of time-honoured favourites and modern Australian compositions, the GO strive to showcase the voice of the guitar in a way that has never been heard before.